I have a few more tips to add about the initial cutting of the fringe. I use a VCR tape or a small hard cover book to wrap the yarn around. Some sources recommend cardboard but it bends as you wrap making the fringes vary too much in length. I use the short side for simple fringe and the long side for the knotted variety. I try to keep a consistent tension on the yarn as I wrap as some yarns can stretch quite a bit but then they pop back after they are cut. I also place a knitting needle against the tape and wrap the yarn over it. Once I finish wrapping I pull the needle out so I have room to slip the tip of my scissors under the yarn wraps before cutting. When placing the fringe along the edge of my knitting I keep the same amount of space between each fringe even either by counting the stitches or by using a finger as a measuring tool. 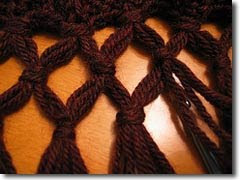 Another technique for placement is to put one fringe at each end and then fold the edge in half matching fringe to fringe and placing the next fringe at the halfway point. As each new fringe is added you match it to another and place the next one in the center.